When you exhibit, assign each booth staffer a trade show specialty or responsibility to ensure you fully leverage your event participation and outcomes. Give a staff member the task of picking up all items shipped to the exhibit hall site and arranging for booth set-up in advance of show opening. This individual must make sure your display is ready each morning before attendees arrive, as well as dismantled, packed and shipped back to your office upon conclusion of the event. Closely manage the staff schedule for the booth to ensure seamless servicing of prospects. Assign someone the responsibility of “shopping the competition” to learn as much as possible about product lines, new developments, sales strategies, literature, promotional message, and pricing. While you should already be aware of the competitive marketplace, seeing and hearing information first hand may give you additional insights. Have one or more of your team members attend conference sessions and speaker programs, if permitted, to learn about trend data or other information impacting your industry. The opportunity to mingle with attendees away from the exhibition hall can be advantageous to your goal achievement. In addition, assign someone the trade show task of walking around the exhibit hall and evaluating displays to see how your booth compares to others. Ask that he or she document sales techniques, giveaways, graphics, and communication strategies that are being used. 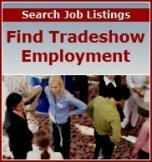 Click here for a Trade Show Check List that you can use for evaluating other exhibitors at the show.